The blood and nerve supply to bones are carried in Haversian canals that run along the long axis of bones. Haversian canals typically run parallel to the surface and along the long axis of the bone and generally contain one or two capillaries and nerve fibers. Volkmann’s canals are channels that assist with blood and nerve supply from the periosteum to the Haversian canal. The vascular supply of long bones depends on several points of inflow. Except for a few with double or no foramina (places in bone where capillaries enervate), 90% of long bones have a single nutrient foramen in the middle third of the shaft. Young periosteum is more vascular and its vessels communicate more freely with those of the shaft compared to adult periosteum. perichondrium: A layer of dense irregular connective tissue that surrounds the cartilage of developing bone. Volkmann’s canal: Also known as perforating holes, these are microscopic structures found in the compact bone that carry small arteries throughout the bone. anastomose: Joined or run together. Haversian canal: A hollow channel in the center of an osteon, running parallel to the length of a bone. Blood is supplied to mature compact bone through the Haversian canal. Haversian canals are formed when individual lamellae form concentric rings around larger longitudinal canals (approx. 50 µm in diameter) within the bone tissue. Haversian canals typically run parallel to the surface and along the long axis of the bone. The canals and the surrounding lamellae (8–15) are called a Haversian system or an osteon. A Haversian canal generally contains one or two capillaries and nerve fibers. The Haversian canals also surround nerve cells throughout the bone and communicate with osteocytes in lacunae (spaces within the dense bone matrix that contain the living bone cells) through canaliculi. 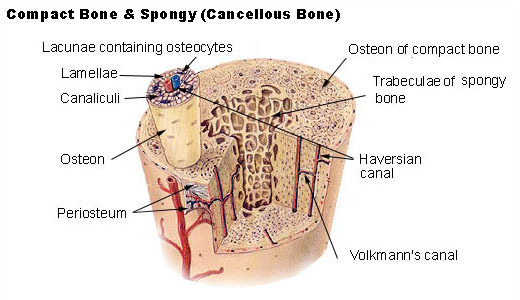 This unique arrangement is conducive to the storage of mineral salt deposits that give bone tissue its strength. Haversian canal: The Haversian canals surround blood vessels and nerve cells throughout the bone. The vascular supply of long bones depends on several points of inflow, which feed complex sinusoidal networks within the bone. These in turn drain to various channels through all surfaces of the bone except that covered by articular cartilage. Volkmann’s canals are channels that assist with blood and nerve supply from the periosteum to the Haversian canal. One or two main diaphyseal nutrient arteries enter the shaft obliquely through one or two nutrient foramina leading to nutrient canals. Their sites of entry and angulation are almost constant and characteristically directed away from the growing epiphysis. Except for a few with double or no foramina, 90% of long bones have a single nutrient foramen in the middle third of the shaft. The nutrient arteries divide into ascending and descending branches in the medullary cavity. These approach the epiphysis dividing into smaller rami. Near the epiphysis, they anastomose with the metaphyseal and epiphyseal arteries. The blood supply of the immature bones is similar, but the epiphysis is a discrete vascular zone separated from the metaphysis by the growth plate. Epiphyseal and metaphyseal arteries enter on both sides of the growth cartilage, with anastamoses between them being few or absent. Growth cartilage receives its blood supply from both sources and also from an anastamotic collar in the adjoining perichondrium. Young periosteum is more vascular, has more metaphyseal branches, and its vessels communicate more freely with those of the shaft than adult periosteum.